An interior view shows the headquarters of Mongolian People's Party (MPP) in Ulaanbaatar, Mongolia (June 30, 2016). Exploring the role of nationalism in Mongolia’s presidential campaign. Mongolia’s presidential election campaign is in full swing, preparing for the vote on June 26. Posters have been hung in the capital Ulaanbaatar as well as in towns and in the countryside; video clips are running on TV. Massive amounts of mud — involving whistleblowers, menus of positions for sale, and the Moonies — are being slung. The officially certified and audited campaign platforms have also been released. At first glance, it seems like the campaign is taking on a decidedly traditional or nationalist tone, but whether this actually responds to a shift in the electorate’s mood or is simply a campaign strategy to fit the candidates that have been nominated is an important question. A seemingly nationalist turn is obvious right away in the campaigns of the three contenders, M. Enkhbold (of the Mongolian People’s Party), Kh. Battulga (Democratic Party), and S. Ganbaatar (Mongolian People’s Revolutionary Party). In this regard, the tone of this election is somewhat different from previous contests. One of Enkhbold’s slogans is “United Mongolia will win,” while Battulga is campaigning on “Mongolia will win.” Not only are these oddly similar (and, in substantive policy terms, meaningless) slogans, but they both include “Mongolia.” Across all three platforms it is noticeable that the candidates repeatedly refer to “Mongolian” and “Mongolia” where previous campaigns might not have. Similarly emphasizing Mongol-ness, the candidates are frequently appearing in campaign literature wearing a traditional deel. While there are also images of the candidates in suits, the deels seem to be proliferating. In the text of the platforms, all three candidates emphasize the territorial integrity of Mongolia. To an outside observer this is always somewhat surprising as Mongolia enjoys stable relations with its two neighbors, Russia and China, and is the only country in Asia that does not have borders disputes. As oppressive as Mongolian economic dependence on China may seem at times, there is no real threat to Mongolia’s territorial integrity. Are these signs of a growing nationalism then? Nationalism has been a strong force in Mongolian political discourse for some time, especially given its geographically and demographically vulnerable situation between two populous, powerful neighbors. As the Kremlin’s control ceased in 1989, nationalism was revived and became a key currency for new political leaders to raise their profiles and capture support from society and voters. Politicians do their best to show off their Mongol-ness by wearing traditional costumes, citing or comparing historical fables and facts, appearing in countryside settings, riding horses, and recalling childhood memories of life in a ger as a herder. Some engage in xenophobic competition over determining each other’s “blood purity” vis-à-vis Chinese ethnicity, but surprisingly not as much regarding ethnic or marital ties to Russia. These sinophobic elements have appeared again in the current election campaign along with anti-colonial discourse in the form of discussion of connections with Western mining/banking corporations. However, none of candidates make any provocative or hostile remarks directed directly at the two neighbors or at Mongolia’s “Third Neighbors,” namely the United States, Japan, and other OCED members. The nationalist discourse and images are not new and are not aimed at specific countries or investors, but they are used to attract voter’s support. The candidates’ platforms draw on issues that have been discussed by the National Security Council in the past even though they do not directly fall into the portfolio of the president. The constitution, national security concept, and laws provide a far-reaching authority for the president to bring any issues to the National Security Council, which is chaired by the president, and includes the speaker of parliament, and the prime minister. The real rationale behind the emphasis of Mongol-ness seems to involve electoral tactics rather than resulting from an increase in nationalism in society. 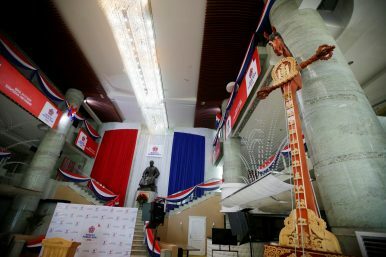 The MPP’s way of explaining their electoral platform uses the metaphor of Mongolia as a ger with walls, a door, a roof crown, and struts forming policy elements of this national house. This “ger” concept is creative, attractive and easier perceived by voters than purely abstract and foreign concepts. MPRP’s candidate Ganbaatar’s appeared wearing the deel at the ceremony for receiving the candidate’s identification card. Battulga, the DP candidate, also appears in a striking black-with-silver-dots deel, simply to showcase his Mongol-ness. The DP’s negative campaign over the MPP’s Enkhbold’s purported Chinese ethnic link aims to distract from the current issues of failed policies on railroads, new local administrative centers, and the privatization of state-owned enterprises. The increased appeal for Mongolia and Mongol-ness in the 2017 presidential election shows political parties’ tactics of distracting public attention from real policy issues (i.e., corruption), by playing on traditionally strong cues of nationalism, blood purity vis-à-vis the Chinese, and a nomadic lifestyle (ger, deel, and horsemanship). However, the imaginable negative version of such positive assertion of Mongol-ness — that is anti-Western or sinophobic sentiment — has been largely absent from the campaign. Mendee Jargalsaikhan is a a Ph.D. candidate in Political Science at UBC.